Live Music Theory Workshop - 15 Locations! 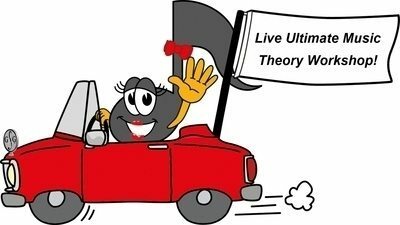 So-La (she's driving) and I are on the road again with 15 locations for the Live Music Theory Workshop Events! I'm so excited to be traveling from Coast to Coast to present these 15 Live Music Theory Workshops - and I hope to be at a location in your area! This Live Music Theory Workshop is Exciting, Educational and Empowering! Register early - it's going to be awesome! Why am I traveling to your area to present a live music theory workshop? Because professional development is SO important for us as teachers. We should always continue learning and sharing our ideas and experiences, and we need to support each other as educators. The human connection of teaching is the MOST important element of all. It is essential that we understand how to connect with others and that we know how to help them learn faster in their own learning style. At the Live Music Theory Workshop you will Learn the 9 Secrets to Generate MORE Results! The Proven System To Instantly Create Better Memory And Increase Test Scores Up To 77%! What are Mnemonics and Why You Need Them To Teach Music Theory More Effectively! The ONE Word I Added To My Studio Policy That Increased My Income By 21%… It’s SO EASY! Early Bird Registration - Receive a Free Gift from Ultimate Music Theory created just for you. Watch for details! Want to Master Teaching Skills to Build Confidence, Enhance Knowledge & Make More Money? this Live Music Theory Workshop is a Must Attend for you! Register Now for the Live Music Theory Workshop! Click on the link below to register for your workshop and get all the details. P.S. Don't see a workshop near you? Contact us to book one!